If you are interested in using SPring-8, please read the following information carefully before applying. 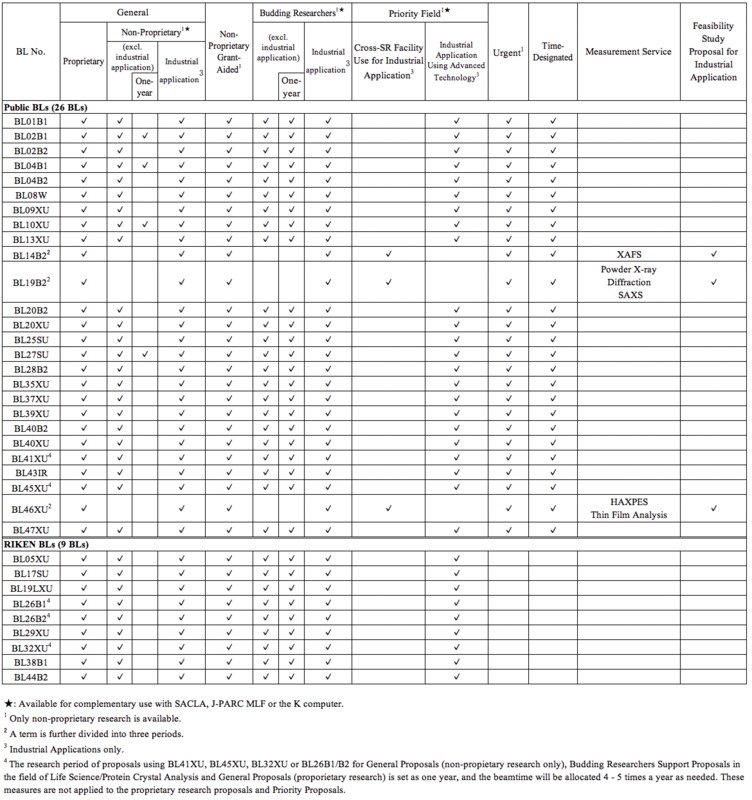 Note　Please ensure to refer to the List of Beamline Summaries before preparing application because there may be possible changes in available experimental equipments at Beamlines due to replacements, removals and other reasons. In addition, prior consultation with Beamline scientist is essential for some Beamlines. SPring-8 operates for 2 half-year research terms (A term and B term) each year. A term, the first half of a fiscal year, typically spans from April to August (incl. summer maintenance period); and B term, the second half, is usually from September to March (incl. winter maintenance period). At the beamlines intended for industrial applications (BL14B2, BL19B2, and BL46XU), however, A and B terms are further divided into three periods: the first, the second and the third period of A term, the first, the second and the third period of B term. There are two types of research available at SPring-8: proprietary and non-proprietary research. Users have no obligation to publish their research results. In return, proprietary users are required to pay the fee for the beamtime used (See 7.1 Beamtime Fee). Submitted proposals are reviewed only from the viewpoint of technical feasibility, safety of experiment, sociality and ethicality. Users are exempt from paying the beamtime fee if their research is non-proprietary. For research to be considered non-proprietary, users are required to publish their results with proper acknowledgement and register the published works with the SPring-8 Publications Database within three years from the end of the research term. We offer a variety of types of proposals each with distinctive characteristics to suit your research needs as shown in the table below. For further details, click here. Measurement Service* The staff of JASRI will perform measurements on behalf of users, and users can choose whether to come to SPring-8 and be present during the measurements or to simply send their samples to SPring-8. *If you are considering submitting an urgent proposal, a time-designated proposal or a measurement service proposal, please contact the Beamline Scientist of the beamline of interest in advance for the availability of beamtime. Eligible individuals are those who can complete radiation worker registration before using synchrotron radiation at SPring-8 and be responsible for experiments carried out at SPring-8 as a leader. Please note that students are not eligible. If you are a doctoral student (at the time of experiment) and wish to apply for beamtime (submit a proposal as a project leader), the budding researchers support proposal is your only choice (as a project team member, you can participate in any research projects). You may be a master’s or doctoral student at the time of proposal submission; but you must maintain your doctoral student status at the time of experiment. Otherwise, your proposal will be switched to a general proposal. All 26 SPring-8 public beamlines and 9 RIKEN beamlines are available to users. To check the specs of the beamlines, click here. 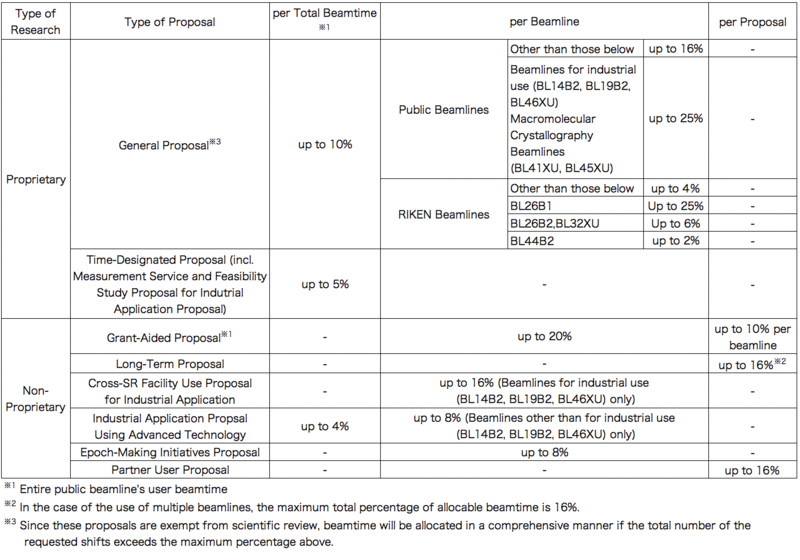 Maximum percentages of allocable beamtime (varies by type of proposals) are summarized in the following Table 3. 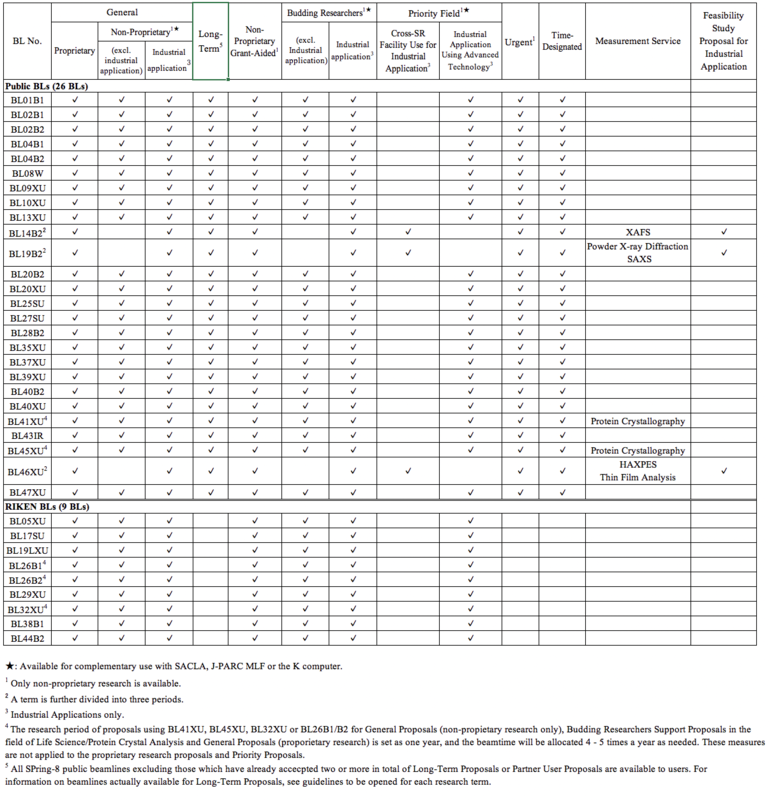 Fees for public beamline use and user fees are summarized in the Table 4. 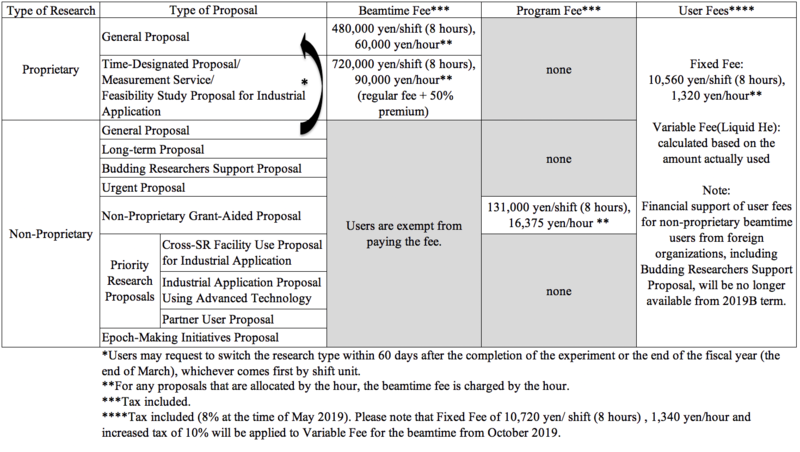 Fees for Public Beamline Use & User Fees. Users are exempt from paying the beamtime fee. Note: From 2011B, users are required to publish their research in a refereed journal or equivalent (refereed proceedings, Doctoral thesis, etc.) and register the publications with the Publications Database within three years from the end of the research term for their research to be considered non-proprietary. For details, click here. For any proposals that are allocated by the hour, the beamtime fee is charged by the hour. Intended for non-proprietary research projects that have been reviewed and approved for a large research grant, Non-Proprietary Grant-Aided Proposals are exempt from scientific review, and only the technical feasibility and the safety of the experiment, necessity of SPring-8 as a research tool, and ethics (e.g. exclusively for peaceful purposes) are reviewed and are available on the payment of program fee. Public beamline users are required to pay the fees to cover the costs of consumables actually used (user fees). User fees are composed of a fixed fee charged for wear and tear on the facility and a variable fee charged for liquid He. For any proposals that are allocated by the hour, the fixed fee is charged by the hour. Important: For certain types of proposals, JASRI will support users by covering the user fees. Please refer to the call for proposals for your eligibility in receiving the support. Click here for more details about the user fees. To submit an application online, you need to have obtained a user account (user card ID number and password) by registering yourself. Please make sure that not only project leaders/applicants but also all project team members are registered as SPring-8 users. If you are not registered as a SPring-8 user, click here to register. Note: Registration information is also used for contact. If your registration details change, please update your account from the UI site. *All users, including repeat users, are encouraged to register to SPring-8 Users Community (SPRUC) Research Group. Applicants (project leaders) are required to submit proposals online from the User Information website (UI site) through the web-based proposal submission system. Log in to My Page with your user card ID number and password. Please note that only the project leaders can submit proposals: if a project team member needs to submit a proposal in place of the project leader, he or she must log in to the project leader's account. In this case, the project leader is responsible for managing his or her account information. It is possible that the web browser crashes while working on an application, so you are strongly encouraged to draft your application offline first using a MS Word template downloadable from here. For step-by-step instructions on how to submit proposals, click here. JASRI generally launches the call for proposals twice a year with the following deadlines. For specific dates, please refer to the call for proposals announced in May (for B term) and November (for A term of the following year). About two weeks before the deadlines for general and other proposals (only for A term). About two weeks before the deadlines for general and other proposals (for both A and B terms). A Term: mid-October (only for A term). B Term: early May (only for B term). We accept applications on a rolling basis (no specific submission deadline). Please allow at least three weeks for processing (from the date of application until you can carry out your experiment). For details, click here. The Japanese Law (Ordinance on Prevention of Ionizing Radiation Hazards) requires all SPring-8 users to be registered as SPring-8 radiation workers. For details, click here. For your safety, do not work alone. Please include your project team member in the online proposal application and make sure to work in a group of two or more. Please be advised that your scheduled beamtime may be reduced or cancelled in emergencies such as equipment failure and natural disaster. In such cases, users cannot claim compensation for the lost beamtime. Users shall take out appropriate personal injury and liability insurance before conducting experiments. If their project teams include students, they shall make sure that all the students take out appropriate personal injury and liability insurance. If users damage SPring-8 facilities, equipment or persons, either willfully or through gross negligence, JASRI may require them to meet all or part of the cost of repairs. JASRI shall take due account of all relevant circumstances in determining the degree of user liability.